These delicious pumpkin sage challah rolls, made partially with whole-wheat flour, are a wholesome and flavorful twist on classic challah. Light and tender, these knot-like rolls are great as a side dish (especially at Thanksgiving!) or used as buns for your favorite sandwich. How do you make challah rolls? Making challah rolls is very similar to making any kind of yeasted dinner roll. To start, you have to proof the yeast (aka activate it) with some warm water and sugar. From there you make a dough using flour, eggs, oil, and in this case, pumpkin. Using a stand mixer, or by hand, you will knead the dough until it is soft and elastic. From here on out the rest is pretty hands off! The dough will rise a couple of times before you’ll divide and form the dough into little knots. The dough knots will rest for one more short rise, then all thats left is to brush them with an egg wash and bake. How do you form challah rolls? It can be hard to visualize how to form dough into knot-like rolls. Instead of offering a different wordy description of how I form my dough into knots, I thought I’d share this short how-to video. Is challah sweet? And what is it like? I’ve been asked this by a few people and I totally get it. With its characteristic glossy sheen, classic challah just looks like it would be sweet. And it does have a slight sweetness to it, but not enough to categorize it as a sweet bread. Too often you’ll find challah that’s too fluffy or overly dry, good-quality challah should be tender but substantial with just a slight sweet flavor. What’s the difference between challah and brioche? Both challah and brioche are made from rich yeasted doughs and are light and tender. They both contain eggs and each are formed into specific, very identifiable, shapes. But that’s pretty much where their similarities end. Challah is a traditional Jewish yeasted dough that’s light and airy, yet firm and slightly chewy. Often made for the Jewish Sabbath, holidays and ceremonial occasions, challah is made kosher (without any dairy) so it can be enjoyed with all meals. You can recognize challah by its long oval-shaped braided loaf. Brioche on the other hand is a French bread that’s made from an egg- and butter-rich dough. The classic brioche shape is that of a small fluted base and a jaunty top knot, but you can also find it as a large sandwich-bread shaped loaf (although it does have a top that resembles a popover). These delicious pumpkin sage challah rolls, made partially with whole-wheat flour, are a wholesome and flavorful twist on classic challah. Light and tender, these rolls are a great as a side dish or used as buns for your favorite sandwich. Combine water, yeast, and 1 tablespoon sugar in the bowl of a stand mixer with a wooden spoon; let stand until foamy, 5–10 minutes. Whisk together remaining sugar, pumpkin, 2 eggs, yolk, and oil then whisk into yeast mixture. In a separate bowl whisk together flours, sage, salt, and nutmeg. Fit stand mixer with the dough hook and slowly add flour, mixing on low speed, 1 cup at a time, until all the flour is incorporated into dough. Increase speed to medium and knead 10 minutes, adding 1 teaspoon of all-purpose flour at a time as needed (no more than 12 teaspoons which is a ¼ cup) to help dough from sticking to sides of bowl. Using a wooden spoon, turn dough out onto a lightly greased surface and form into a ball. 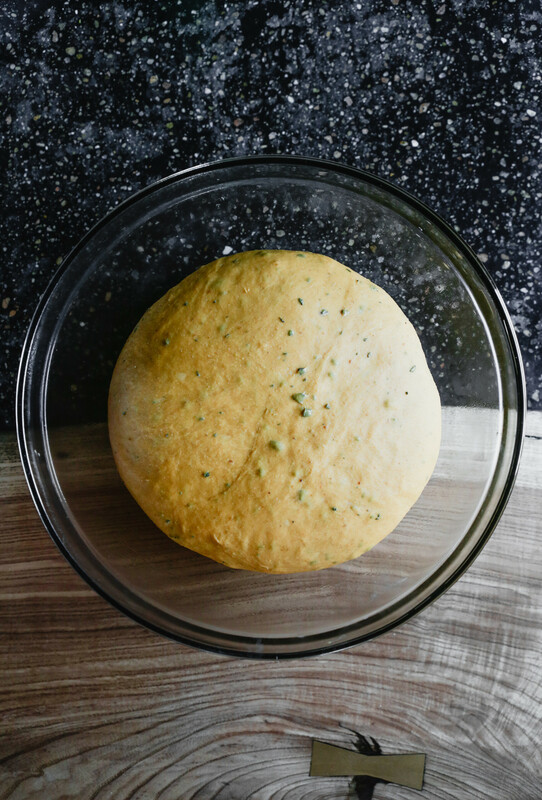 Place dough in a lightly oiled bowl, cover with plastic wrap, let rise 1 hour then punch down, cover, and let rise until doubled in size, 1 hour more. Heat oven to 350° with racks set in upper-middle and lower-middle positions. Line two baking sheets with parchment paper. 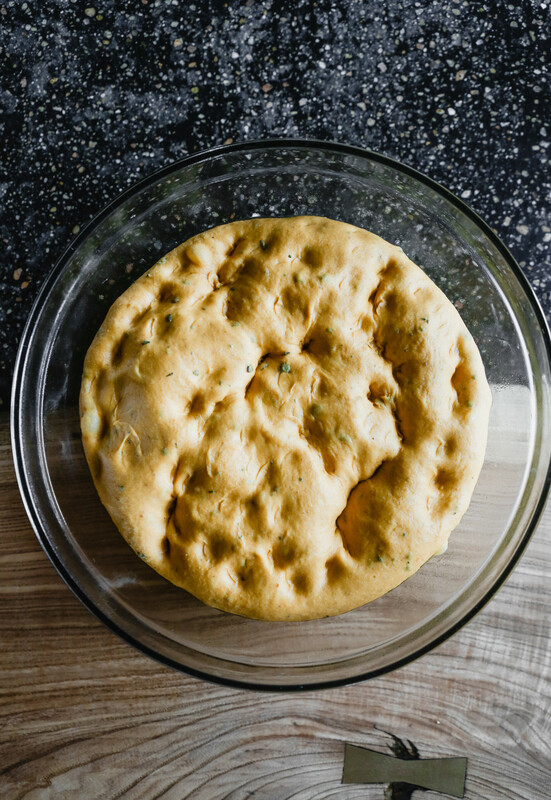 Divide dough into 16 equal pieces (for the best results weigh dough as a whole, divide weight by 16 and portion rolls out to all measure the same. I had 2-ounce dough balls). Roll a dough ball into a 10-inch rope, tie like a knot, lightly tug bottom tail end up and around side of knot and down through center, then lightly tug top tail end down and around side of knot and up through center. Repeat rolling and tying with remaining dough balls. Transfer dough knots to prepared baking sheets, loosely cover with plastic wrap, and let rise until risen by half their size, are puffy, and slightly spring back, leaving an indentation, when poked with a knuckle, about 35 minutes. Whisk together 1 egg and 2 tablespoons water for the egg wash. Brush rolls with egg wash and sprinkle with pepitas and sesame seeds. Let rolls cool on baking sheets 5 minutes, then transfer to a wire rack to cool completely or serve right away with softened butter and warm honey. Transfer the dough to a lightly floured work surface, and knead the dough by hand for 10 minutes, adding more flour as needed by tsp. Increments. Rolls can be made up to 3 days in advance. Reheat rolls in oven heated to 325 for 5–7 minutes.